Bingo fun plus songs from the past! Memory-evoking set includes 40-minute CD. 50 clips of easy-to-recognize songs. Songs span the 40s, 50s and 60s. 20 different 8-1/2" x 11" bingo cards. 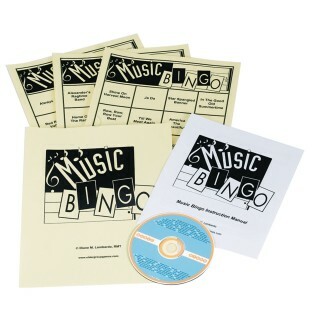 Combine the fun of Bingo with memory-evoking songs from the past! Set includes an approximately 40-minute CD with 50 clips of easy-to-recognize songs from the 40s, 50s and 60s. 20 different 8-1/2" x 11" bingo cards. Sure to be a favorite with the added fun of singing along with the CDs as players search their boards! Can also be used to play Name That Tune. Markers not included. The resident's had a fun time listening to the music and figuring out the tunes def. a home run!